Dog tags are due by May 1st of each year. It is unlawful to allow any dog to run at large. Dogs must be leashed at all times. Dogs are not allowed in any public park at any time, whether leashed or unleashed. It is unlawful to keep any animal that disturbs the peace by loud noises at any time of the day or night. Applications for all building permits shall be made to the Village Clerk. Permits are required to construct or alter any building. Sidewalks are required along the frontage of premises to which a permit is issued. Permits are also required to construct a billboard, swimming pool, sidewalks and driveways. 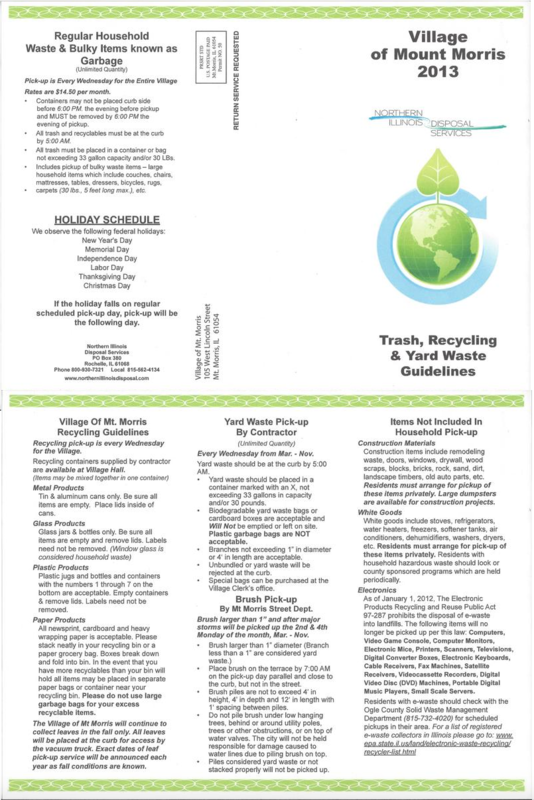 For complete Village ordinances or more information please contact the Village Clerk’s office or any officer of the Village. All open burning of refuse, leaves, grass or brush is prohibited. Small recreational fires of wood only are allowed in a fire safe vessel or pit not exceeding thirty inches (30″) in diameter. Any recreation fires must be extinguished by 12 o’clock (12:00) midnight. All recreational fires must be supervised by an adult at all times. After a snowfall depth of two inches (2″) or more it will be unlawful to park any vehicle on any public street unless the snow has been plowed or otherwise removed from 7:00 a.m. on that day and 7:00 a.m. of the following day on even calendar days. Vehicles may be parked on the odd numbered side of the street between the hours of 7:00 a.m. on that day and 7:00 a.m. of the following day on odd calendar days.